My newest journey through art Ceramics in general are what i am studying currently. I have created my first fairy figure with feather wings and a lock of my glorious hair to finish. 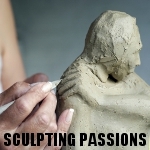 would love to hear my fellow sculptors' inspirational words on clay. Does woliver11 belong in this group? Does imsopretty belong in this group? Does yessirnosir belong in this group? Hey there I took ceramics in high school and some in college. I haven't been able to do much after. Does darlawolf belong in this group?